Children at Downlands Primary School in Blandford have written letters to Malala, the Pakistani schoolgirl activist who nearly died for campaigning for girls' education. 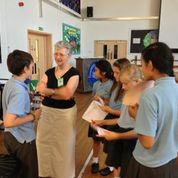 They attend a 'rights respecting school' which is part of a UNICEF programme to encourage awareness of human rights, especially children's rights. It was lovely to meet young people who are being encouraged to think about our wider world. Aesop's Fables in the Magaliesberg!